WASHINGTON – U.S. Senators Ben Cardin and Chris Van Hollen (both D-Md.) have announced that the Montgomery County Volunteer Fire and Rescue Association and the Hyattsville Volunteer Fire Department have been awarded a total of $1,229,000 from the Federal Emergency Management Agency (FEMA) to recruit and train new volunteer firefighters. The grants will ensure adequate staffing levels to respond to fire and emergency medical calls. The Montgomery County Volunteer Fire and Rescue Association has been awarded $530,000 to recruit and retain volunteers to adequately staff the 19 volunteer stations throughout Montgomery County. Their program will provide a valuable tuition assistance program for active volunteers to pay for college courses. In addition, the Association will reinstitute a high school cadet program to recruit and train high school students to become volunteers from the County’s 26 high schools. Several years ago during the recession Montgomery County had to cut funds for a very successful high school cadet program. 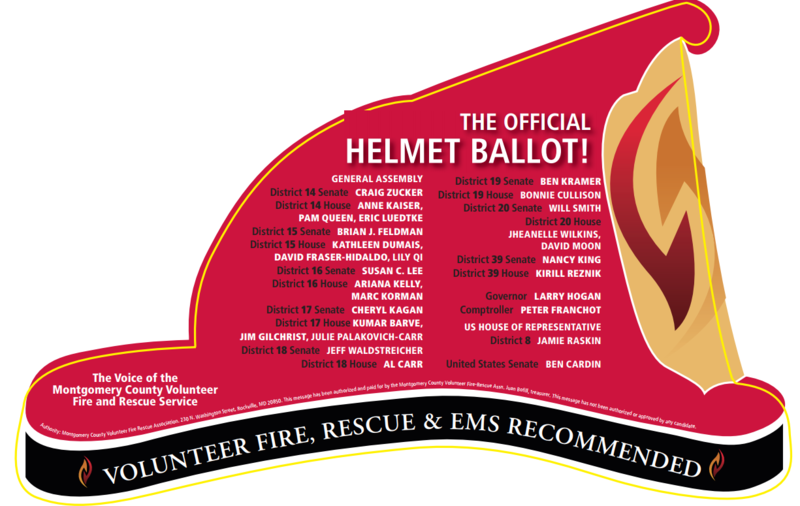 The Hyattsville Volunteer Fire Department has been awarded $699,000 to initiate a county-wide volunteer firefighter recruitment effort to support the 37 volunteer Fire/EMS Departments in Prince George’s County in conjunction with the Prince George’s County Fire Commission and the Prince George’s Volunteer Fire and Rescue Association. In cooperation with the MCVFRA, Montgomery County government has issued a press release regarding solicitation for fire departments within Montgomery County, MD. The Press Release discusses how to ensure your donation goes where you intend to, and how to avoid being scammed. The Montgomery County Volunteer Fire – Rescue Association announced Thursday the notification of a new SAFER grant to support volunteer fire/rescue recruiting. August 27, 2015 — Rockville, Maryland —The Montgomery County Volunteer Fire- Rescue Association received notification of a federal Department of Homeland Security (DHS) SAFER (Staffing for Adequate Fire and Rescue Response) grant today to support its core mission of recruiting new volunteer fire and rescue providers serving in the 18 volunteer fire and rescue departments in Montgomery County. The award of $539,463 is the third SAFER grant the MCVFRA has applied for and been funded since 2007. The newest grant continues funding for an additional four years for a full-time volunteer recruiter, including all benefits, funds to maintain and operate the first in the nation volunteer recruiting station, and maintaining a robust, effective and nationally recognized multimedia advertising campaign in the region. “These funds come at a time when the challenges in recruiting new volunteers are greater than ever” said Eric N. Bernard, the Association’s long-time Executive Director. “This is a huge boost to our efforts and will assure continued success. We depend on the SAFER grants to allow us to reach out into our neighborhoods and let them know that we need new volunteers to serve!” he added. The MCVFRA completed a 43 page recruitment business plan in 2006 when a centralized recruitment effort was developed to include all the County’s local volunteer fire and rescue departments. Over the past three years the plan received major revisions, updates, and completion of dozens of goals initially set. “Our success directly relates to the combined efforts in recruiting and having our recruitment business plan, a complete multimedia marketing plan, and coordination with all the volunteer departments and Montgomery County government” Bernard stressed. “The SAFER award reflects our excellent plans, goals and outcome in the preceding grants and recognizes the significant effort and success the Association maintains in recruiting new volunteers” Goodloe noted. About The Montgomery County Volunteer Fire – Rescue Association: Founded over 94 years ago, the Association represents the professional volunteer men and women who serve as firefighters, rescuers, EMTs, paramedics, and administrative members in 19 local volunteer fire and rescue departments in Montgomery County. With over 2,400 members, the Association remains as one of the largest and most active organizations of its kind, working to strengthen and grow the volunteer system in Montgomery County. These proud volunteers donate tens of thousands of hours each year, save County taxpayers countless millions of dollars, and provide residents with the highest quality of emergency care in the country. 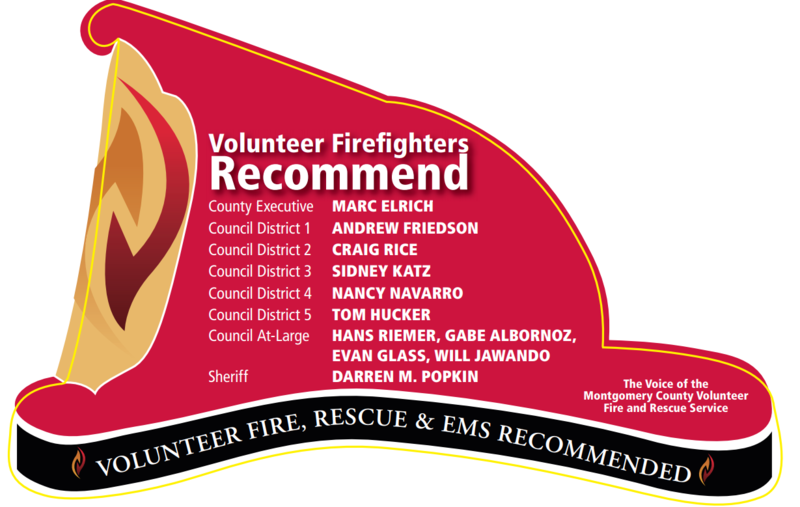 Additionally, the volunteers own and operate the majority of the fire and rescue stations in the County and are routinely, without tax dollars and using donated funds, purchasing new fire engines, trucks, rescue squads, and ambulances, for use in service to the residents of the County. Working side by side with career firefighters in 38 fire and rescue stations, taking the same training and meeting the same requirements as the career members, the volunteers of the Association are dedicated to saving lives twenty-four hours a day. April 21, 2014 – The Hillandale Volunteer Fire Department is saddened to announce the death of Joseph Weisgerber. Joe was a member of the department for 65 years and served in many capacities including as a delegate to the MCVFRA at the time of his death. Relatives and friends may call at Collins Funeral Home, 500 University Boulevard West, Silver Spring, MD (Valet Parking), Monday, April 28 from 2:00 to 4:00 pm and from 7:00 to 9:00 pm. Tuesday, April 29, at 11 am. Interment at Arlington National Cemetery at a later date. April 19, 2014 – It is with deepest sorrow that the Wheaton Volunteer Rescue Squad announces the death of their President and Life Member Thomas C. Brown. The Bethesda-Chevy Chase Rescue Squad would like to invite all to join us for the first annual Res1cue Run 8K road race. All fire/rescue/public safety personnel receive a 25% discount on registration. Register here , and check the box for fire/rescue personnel. Each station or department team may have as many runners as desired. The top three finish times for each team will be totaled, for your team finish time. …and takes it home to your station until next year’s event. 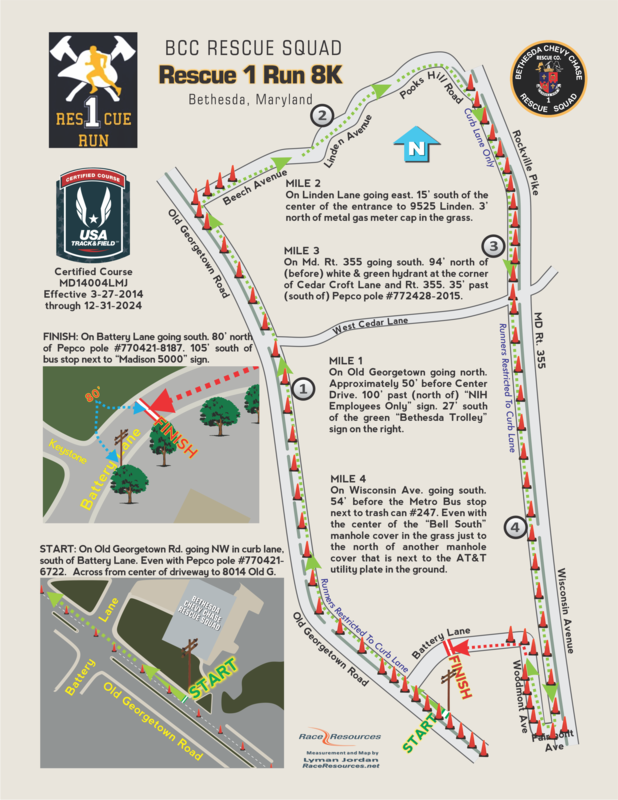 Our flat and fast 8K course is USATF certified. There will be water, Honest Tea, bananas, and other food provided for runners at the start and finish, and two water stops along the route. All participants receive custom premium dry-fit t-shirts. Race day is May 4, 2014. Start time is 0800, at Rescue 1, 5020 Battery Ln. Will you make the cut? Go here to register, or visit the RES1CUE Race web site for more information. Also check out our Facebook page. The Burtonsville Volunteer Fire Department is sponsoring a 5k run and fun walk on May 10, 2014. See the attached flyer for more details. 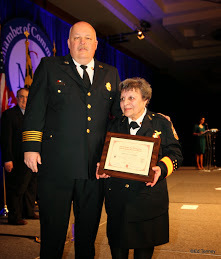 March 14, 2014 – At the Annual Public Safety Awards luncheon, the Montgomery County Chamber of Commerce honored MCVFRA President Marcine Goodloe by bestowing upon her the Chief Leslie B. Thompson Community Service Award. The award is a recognition of an individual’s volunteer dedication and initiative above and beyond the call of duty over a period of time that has affected and benefited the citizens of Montgomery County and beyond. Mrs. Goodloe has served as the president of the MCVFRA since 2004 and is the first woman to serve in that position during the Association’s 90+ year history. The Chamber also recognized her for having worked with the Public Safety Awards Committee since its inception 40 years ago. For additional photos from the ceremony, visit MCVFRA Photographer Ed Tenney’s album here. November 16, 2013 – Wheaton Volunteer Rescue Squad opened their new station located at Georgia Ave. and Arcola Ave. with a ceremony attended by several hundred citizens, County officials and fire/rescue personnel from other departments. After ceremonies, which included a procession of the Rescue Squad’s apparatus from their old station to the new station, the public was invited to tour the two-story station. The station has four drive-thru bays, enlarged facilities for the personnel staffing the station, a large community/meeting room with a commercial kitchen and ample parking.